Here we go again... Dim Sum with the mother-in-law. It has become such a common occurrence, I've even started to enjoy her company. What??? Not! Well, it probably has more to do with me tuning out and daydreaming than anything else. Again, there was the usual requests to go to Tung Sing Chin once again. However, I suggested we head over to the Broadway location of Szechuan Chongqing instead. Wait a minute. Cantonese Dim Sum at a Szechuan joint? Are you mad? No, I'm not, but eventually sometime during the meal I would be (especially with MIL at the table). Actually, i n the past, when we used to live in Downtown, Viv and I would frequent the place not only because it was half-decent, it was also inexpensive. Well, that was then... Seems like inflation set in and the prices are roughly on par with other restaurants in this class. The one thing going for the place is the free parking spots at the back (albeit the few that there are). They still employ push carts here, as rare as it is these days. However, being such a small place, there are only like 2 carts maximum in action at one time. Hence, we practically got all of our items as quick as we sat down. Good for those who are hungry. Bad for me, where I had to get all my photos as quickly as possible. 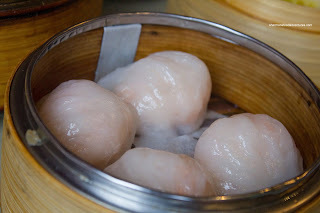 Since there was no real order to the food arriving at our table, I'll start talking about the most important item first - the Haw Gow (steamed shrimp dumplings). The dumpling skin was slightly on the chewier side, yet was thin enough where it wasn't doughy. The shrimp filling had a good bounce and crunch where it was very well-seasoned. It partially overwhelmed the natural sweetness of the shrimp though. As always, we got the Sui Mai (pork & shrimp dumpling) to go along with the haw gow. These were smallish in size and were moist. The moistness was a blessing and a curse at the same time though. The dumpling ended up being a touch soft because of it. 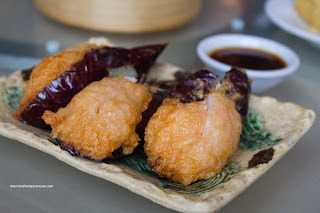 Despite this, the shrimp were nicely prepared where they exhibited a good crunch (which alleviated the softness of the meat somewhat). Once again, the dumpling was well-seasoned. 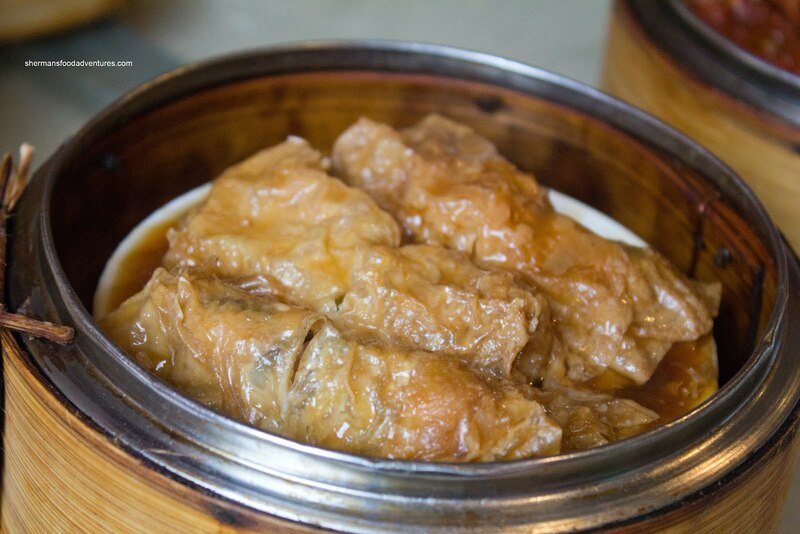 One particular item that I seem to always order is the Bean Curd Skin Roll. Yes, it doesn't sound that appetizing and its wrinkly appearance may concern a few people. Hey, don't knock it until you try it! It is essentially pork filling encased in fried bean curd sheets. 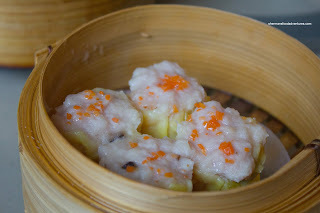 These rolls were somewhat loose with a filling consisting of ground pork, bamboo shoots, wood ear mushrooms and carrot. Overall, the roll had a good texture from the tender meat to the chewy (yet soft) bean curd skin. There was just enough oyster-based sauce to kee p the rolls moist. 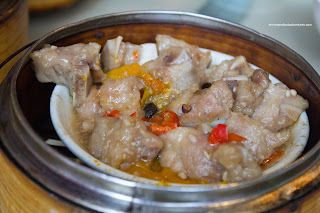 Another favourite of mine is the Steamed Blackbean Pork Spareribs. These were slightly over-tenderized where they were easy to chew, yet lacking in bite. The squash underneath the ribs was a mushy mess which was neither aesthetically-pleasing nor edible. 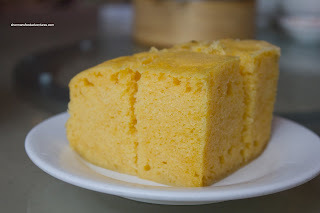 The flavours were good with a good balance of savoury, sweet and a hint of spiciness. Now, this is where I would usually be talking about rice noodle rolls since my kiddies love them so muc h. However, they somehow got turned onto sticky rice. Then of course, we had to get the Lo Mei Gai (sticky rice wrapped in lotus leaves). The rice itself was a little dry, yet it was moistened by the abundance of filling (which included ground pork, shiitake mushroom and dried shrimp). With no lack of ingredients, this made the entire thing flavourful while not salty either. 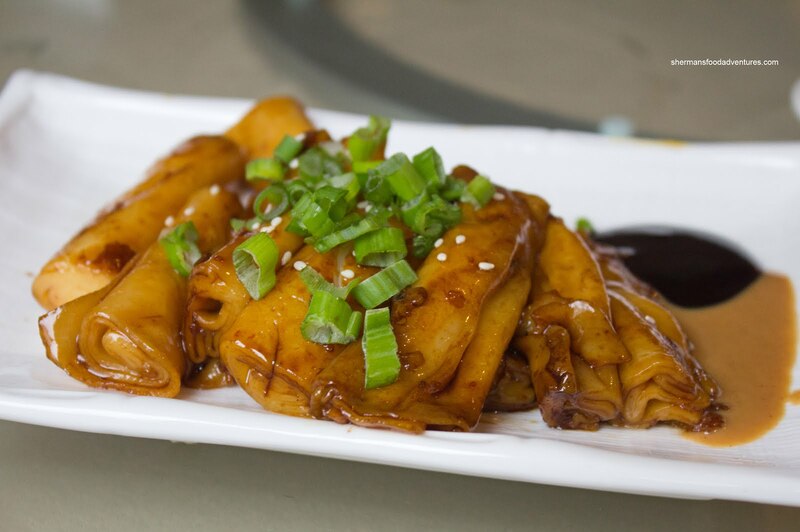 Now just because we got the lo mei gai, that didn't mean we couldn't get the Soy-Fried Rice Noodle Rolls. Well, in the end, we were glad that we got both because the portion size of th e rice noodle rolls had to be one of the smallest we've ever seen. I guess they made it up with quality as the noodles were soft and properly caramelized by a good pan-fry. They weren't that greasy and there was plenty of flavour. 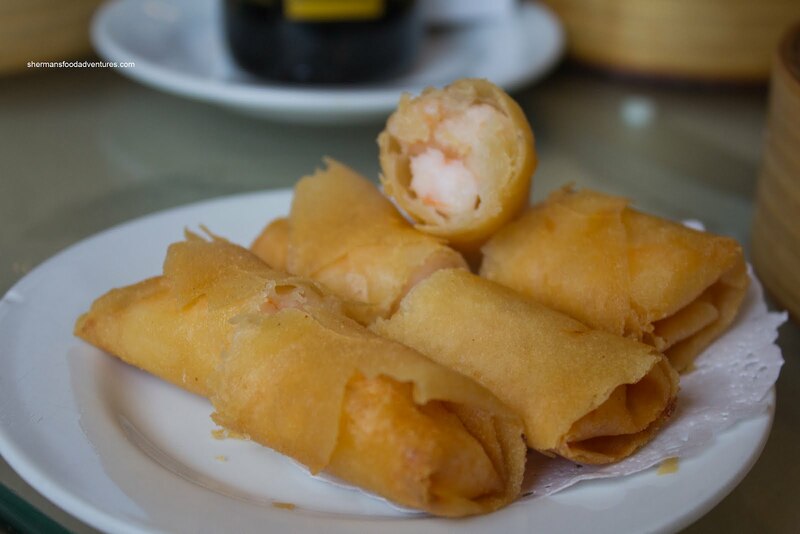 Continuing on kiddie favourites, we got the Shrimp Spring Rolls as well. These arrived hot with very little to no grease at the bottom of the plate. These were obviously fried at the right temperature. The result was a crisp exterior which revealed lots of whole, crunchy shrimp. The only negative thing about the spring rolls was the overuse of salt, which completely masked the sweetness of the shrimp. Although this was not the end of the meal, it seems fitting to talk about the Mah Lai Goh or steamed sponge cake here since it is a kiddie favourite too. This came out steaming hot and very moist. Texture-wise, this was bang on. In terms of flavour, that was another story as they used far too much sugar. The kiddies loved it (duh... sugar), but I could barely eat a piece since it was so sweet. 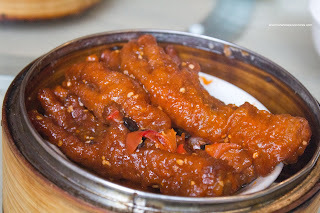 Moving away from kid favourites, we had the Phoenix Talons (or chicken feet). Yah, that will be the day when my son would eat this... Anyways, despite the appearance of sauce atop the chicken feet, there wasn't really all that much on the plate. Hence, they were slightly dry. That didn't mean it was a total loss. Rather, they were fried nicely where the skin and gelatin underneath stayed intact. The dish was not devoid of flavour either as there was plenty of black bean, garlic and chili flakes. 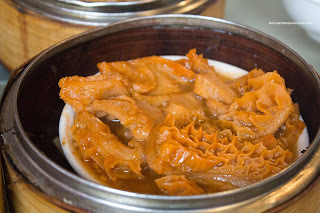 Onto another adult-only item was the Steamed Beef Tripe. Normally, these need to be rinse vigorously over an extended period of time. Otherwise, the gaminess of the tripe cannot be masked by any form of seasoning. In this case, we could definitely taste the gaminess. Despite this, the dish was predominantly sweet where it could've used more salt and some spice. Flavour issues aside, the texture of the tripe was perfect though. It straddled the fine line of being tender while retaining a chew. Lastly, we had the Stuffed Eggplant with shrimp mousse. 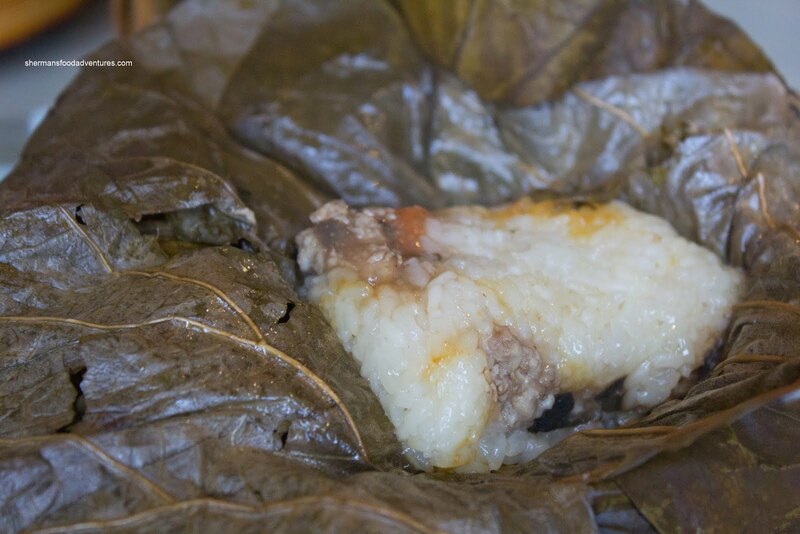 It came out hot and crisp with moist eggplant and "bouncy" shrimp filling. Again, the oil must've been the right temp because the eggplant was not greasy. The little sauce that was provided was flavourful enough for the amount of eggplant on the plate. 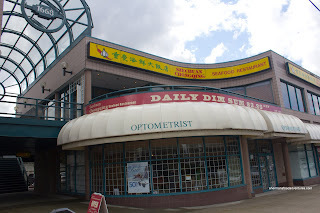 Hey, it ain't the best Dim Sum we've ever had, but it was not bad considering it is a Szechuan joint. Prices are not as cheap as they used to be, yet it isn't incredibly unreasonable either. 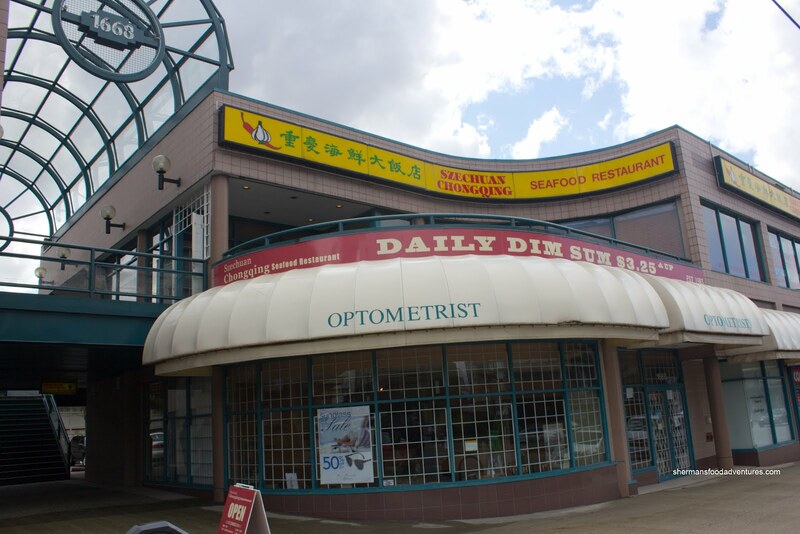 The place does the job considering there are only a few other Dim Sum joints nearby. "Are you mad? No, I'm not, but eventually sometime during the meal I would be (especially with MIL at the table)." Broadway is definitely their worst location these days. Everyone should definitely go to the new location by Metrotown for the best food. In case you guys didn't know, paying CoV's parking meters by phone gets you a discount vs. paying by coinage. And the advantage is when your meter time is up, the service texts you a reminder to your phone and you can "top up" more time via the phone without walking back to the meter. However this may not work at some locations if the max. allowed parking time is short. Still doesn't solve the MIL problem, but hey, one solution at a time eh Sherman ?